We love doing these little chickens on the grill. Well, mon mari loves doing everything on the grill and why would I complain about that? I try to find hens that are small enough for single servings, although, sometimes, we have a bit leftover for lunch. Use any fresh herbs you like. Put herbs and garlic into a small bowl. Add the lemon juice, salt and pepper. Mix well. 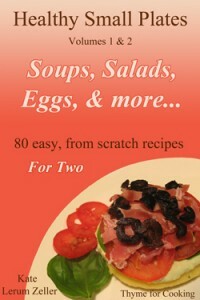 Add enough olive oil to make a thin paste – it won’t hold together but it shouldn’t be like a vinaigrette. Wash hens and pat dry with paper towels. Carefully work your fingers between the skin and the flesh on the breast of the hens, loosening skin. When it is nice and loose, as far as you can do it without tearing, spread the herb mixture under the skin. Pat the skin back in place. Spread more of the herb mixture on the birds, put any remaining herbs inside the birds. Tie legs together with kitchen string and fold wing tips under back (at first joint) – keeps them from flapping. Cook hens on barbecue grill over indirect heat for 45 – 60 minutes or until done. When done, remove from heat, cut string and serve – don’t forget finger bowls (it’s messy) and bone bowls (to keep your plates tidy). We had thunderstorms last evening. We needed the rain as it’s been very dry, but we could have skipped the wind. It only lasted for about 10 minutes…. But that was enough to blow the flower pots off the pillars by the gates and a few pots of geraniums off the well. It blew a few screens off the windows and dirt and leaves into the house… All over the beds I had just made up for our guests. It also, apparently, blew the front gate open. Mon mari let the girls out at the usual time while I was making dinner. About 10 minutes later I realized that I didn’t hear any barking. They always bark at night. He came back a few minutes later, had a sip of wine, and said I didn’t see them. It’s really raining hard. Bonnie hates the rain. She barks to come in immediately when it starts raining. The gate was wide open and there were no dogs in sight. I called for a bit…. Nothing. I went back inside, grabbed a jacket, my rubber garden shoes and went out to search in earnest. Bonnie was slowly walking up the road to the gate, absolutely soaked. I put her inside and went back out, calling for Guapa. Then I remembered the neighbors’ pool. I ran back for my flashlight. When I went out again, there was a very pathetic, brown and white dog doing a drowned rat imitation staring at me. We went in the house. Both dogs went to their respective beds and panted for the next 15 minutes. I have no idea what they did but I’m guessing it was fun. Although I did see paw prints in my herb garden…..
And 2 of my tomato plants were laying on the ground, stakes and all…. It never ends with dogs. Do you get the little chickens fresh? Here we can only try them from frozen. Katie, dogs are like 2 year old toddlers! Sadly, that does not change until they are quite old, at that point they then slow down…however, their brains are still in full gear 2 year old mentality. At least that was how it was with our lab…bless her heart! They never the less bring much joy to one’s lives don’t they? And, life is never boring! Sure makes you wonder what your dogs were up to…. Running amok is my guess and loving it !!! The wind blew screens off the windows?! Wow! I don’t think I’ve ever experienced anything like that. No wonder you didn’t notice that the dogs were out making hay. Or something…. 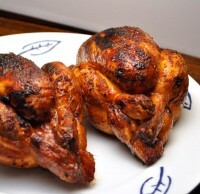 You grilled cornish hens look fabulous!! The kids will be happy to remake the beds and any other chores you have. Doing chores in France will be much more exotic than home! The chicken looks wonderful! Elizabeth, that’s a bit deceptive…. They’re not fastened like in North America. But it was very windy.